Will not puncture under weight of industrial steel wheel traffic. Replaces ordinary butyl, silicone, polysulphide and urethane joint fillers. No primer needed. Flexes up to 50% so joints stay in place indoors or out. Low odor product may be used in food production areas without shutting down. Used to fill wall/floor joints, expansion joints, control joints, holes and concrete imperfections. Ideal for installing anchor bolts in concrete. Joint Guard™ maintains the same strength at any thickness. 60 - 70 linear feet at 1/2" x 1" per unit. Pre-measured components in a 2 gal kit for easy application. 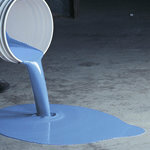 Components include: 1 gal Part A (resin) and 1 gal Part B (hardener) - volumes approximate. Joint Guard™ is approved for shipping to all 50 states by ground or air. Can Joint Guard™ be used to fill in cracks as well? How soft is Joint Guard™ after curing? We have used other caulks in the past that would break up from dragging pallets. Joint Guard™ cures to a hard finish similar to the hardness of a roller blade wheel to resist heavy traffic loads and at the same time flexible enough to withstand any movement in the joint. Can I use Joint Guard™ outside? Absolutely, Joint Guard™ can be used outside, just maker sure the area being repaired is dry during application. How thick can I apply Joint Guard™ in an expansion joint? You can apply Joint Guard™ at any thickness in a joint. Can I use a coating on top of Joint Guard™? Yes, you can use any coating on top of Joint Guard™. However, if you are using Joint Guard™ in an expansion joint with movement, it is best to tape off the joint and coat around the joint leaving the Joint Guard™ exposed to allow for movement.